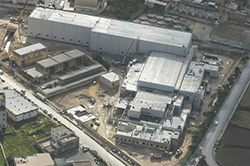 This facility was one of the fastest concrete structures to be erected in Malta, which was a key factor that led to the completion of the project within a period of 24 months. The design incorporates energy-saving measures, including utilisation of natural light, building insulation and waste water minimisation processes. The facility’s energy usage is monitored through a Building Management System which controls the air-conditioning, ventilation and lighting. The system ensures that all utilities are used efficiently and effectively. In fact, the facility’s design was awarded a “best practice” by The Coca-Cola System and its design elements have been shared with other bottlers around the world. Rain water is collected in underground reservoirs then used for washing distribution trucks, toilet facilities, landscaping irrigation and road washing. The car parks are equipped with oil/solid interceptors to make sure that any oil spillage is trapped before being sent to the government waste-water treatment plant. The facility is made up of four major blocks, including the administration, stores, production, and the warehousing block, with a ring-road surrounding the whole area. The administration block houses modern offices which have been designed in a way that maximises space and enhances the day-to-day working environment of the employees. The stores are located below the production hall and house all the raw materials. This set-up allows easy and efficient transport of materials from the store to the production hall. The main production hall incorporates two PET production lines where the Coca-Cola range of products are produced. One production line is dedicated to the bottling and packaging of carbonated soft drinks. The other production line is utilised for the bottling of the Kristal Table Water range. This line also has the capability of bottling carbonated soft drinks in one-way glass. A secondary production hall houses a kegging line where kegs are filled to be dispensed in draft systems in retail outlets. The finished goods warehouse is 18 meters high, covers an area of 4,500 square metres and has beams spanning 35 metres and weighing up to 62 tonnes. 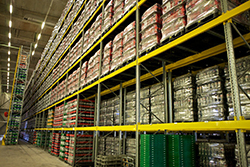 All products are stored on racking 7 pallets high, having a total capacity of 7,200 pallets. The flooring is super flat and durable which is required for the use of very narrow aisle (VNA) fork lift trucks where the operator elevates with the load for increased visibility. The facility has an in-built interactive viewing gallery (The World of Coca-Cola) that takes visitors on an audio-visual journey throughout the operation, thus permitting them to view what it takes to produce a bottle of Coca-Cola, from the bottle-blowing process to the final warehousing.